A year ago you set up a retail business that specialises in selling electronic entertainment equipment. You are still learning and regularly read trade magazines for education purposes and to keep up with developments in the industry. 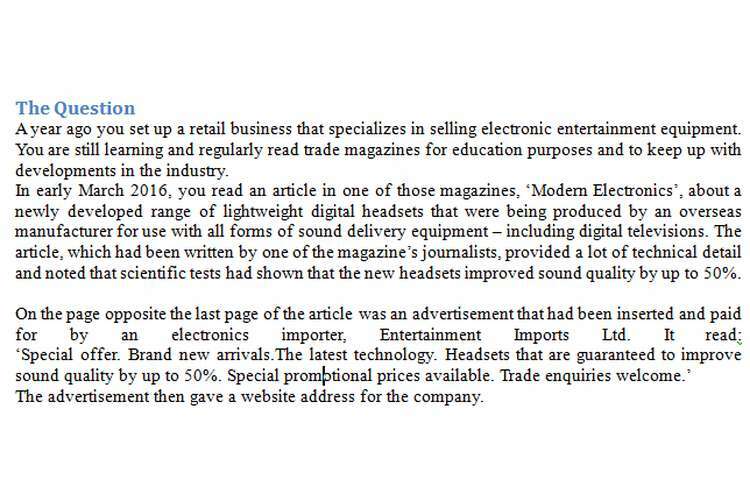 In early March 2016, you read an article in one of those magazines, ‘Modern Electronics’, about a newly developed range of lightweight digital headsets that were being produced by an overseas manufacturer for use with all forms of sound delivery equipment – including digital televisions. The article, which had been written by one of the magazine’s journalists, provided a lot of technical detail and noted that scientific tests had shown that the new headsets improved sound quality by up to 50%. The advertisement then gave a website address for the company. You checked the website and found a catalogue and price list with a special section for the advertised headsets. The catalogue described them as ‘the very latest technology from overseas,’ as, ‘a whole new experience in sound reproduction’ and as, ‘like nothing you have ever experienced before’. You then telephoned the company in mid-March 2016 and spoke to a salesman. You explained that you had a retail business specialising in electronic entertainment equipment and that you were interested in ordering 1,000 of the advertised headsets. You also told the salesman that you were considering running your own special promotion in July and advertising the headsets in the local newspaper. The salesman agreed that your idea was very good and told you that he thought that it could generate significant sales. He also told you that there would be no problem providing the required 1,000 headsets in time for your proposed July promotion. You then discussed the detail of the agreement. You agreed that the headsets would be delivered no later than Friday 15 July 2016, a week before your special promotion and advertising campaign. In the course of that conversation you also told the salesman that you would put your advertisements in the local newspaper on the morning of Saturday 16July so you could take maximum sales advantage of the weekend trade in the shopping centre in which your shop was located. You also agreed that that 500 of the 1,000 headsets ordered would be white and 500 would be black being the two colours that you thought would sell the best and that the full price of $10,000 would be payable on delivery. The salesman said that this was company policy because you were not an established account holder. You signed and returned the form to Entertainment Imports Ltd without reading it. On Thursday 14 July 2016 you were urgently and unexpectedly called away to a family emergency from which you did not return until Saturday16July 2016. Before you left, and to ensure that nothing went wrong with the delivery of the headsets you wrote a cheque for the full amount of the purchase price and couriered it to Entertainment Imports Ltd’s office that Thursday morning. It arrived at midday and Entertainment Imports Ltd banked it that afternoon. When you finally returned on Saturday morning there was a message on your mobile phone which you had forgotten to take with you from your store manager, telling you that the headsets had not been delivered on Friday 15 July 2016. You then tried to contact Entertainment Imports Ltd and eventually spoke to the salesman with whom you had dealt. In reply to your question about the headsets he said, ‘We had the boxes out on our loading dock for you to collect all day yesterday but no-one came to collect them and you did not answer your mobile’. You replied saying, ‘You guys were supposed to deliver them’. ‘No’, said the salesman, ‘the contract only specified the date for delivery, not that we had to deliver them to you at your shop. Whenever we have to deliver goods to a customer’s premises we charge a delivery fee and that part of the contract form was not filled in’. You told the salesman that you were not happy but that you thought that it could still be possible to salvage the situation. You told him that you would pick the goods up that afternoon and that was arranged. You picked the boxes up just after 3pm and took them to your store – arriving just as the shopping centre was shutting for the day. You secured the boxes in your stock room but took one full box home with you to do a quality test before putting the headsets out for sale the following day. The first thing you noticed was a notation on the box to the effect that the headsets could only be used with LCD televisions and not with all sound equipment as you had thought. You then tested a sample of 20 headsets on your television and found that 10 of them had very poor quality sound reproduction far worse that that provided by the other headsets that you already had in stock in your shop. They were also heavier than other similar headsets and far less comfortable to wear. You also noticed that all of the headsets in that box were a black and white combination with black ear-pieces and a white cord. When you checked the remainder of the boxes the next morning, you found that the entire consignment was exactly the same: that is they all had black ear-pieces and a white cord. You rang the salesman and told him that you were rejecting the entire consignment, that you wanted your money back, that you wanted to be reimbursed for the costs of your newspaper advertisement and that you expected to be compensated for both lost profits and the aggravation and frustration that you had suffered as a result of Entertainment Imports Ltd’s breach of contract. The salesman told you that Entertainment Imports Ltd had done everything it was required to do under the contract law and that, if anyone was in breach, it was you as you had not paid for the headsets ‘on delivery’ as required by the contract and you had also failed to pick them up on the due date for delivery as set out in the contract.